We love peppermint bark (especially during the holidays! ), but couldn't find one that met our standards. 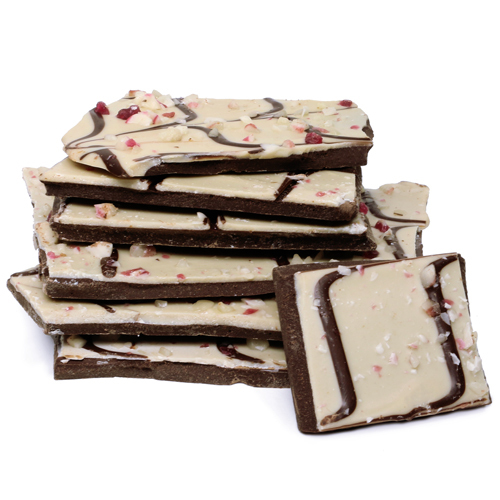 So we developed this exclusive natural peppermint bark made with all organic ingredients. In addition to being gluten-free and soy-free, it's amazingly vegan, too! 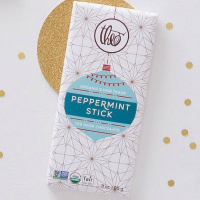 With layers of dark chocolate and white chocolate, peppermint candy sprinkled on top, and minty goodness throughout, it's melt-in-your-mouth, tongue-tingling delicious! 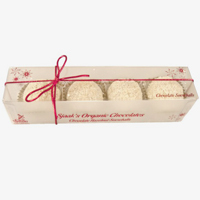 Choose from just the bag of bark or get it packed in a gift box. Please note:This bark is made by hand and varies in thickness. It's sold by weight and the number/size of pieces per bag can vary depending on how thick they are. Also, the color of the special vegan, organic white chocolate varies from batch to batch and in 2016 we've noticed it's bit darker than in past years. This is normal and just as delicious! Ingredients: Organic 60% dark chocolate (organic evaporated cane juice, organic cocoa paste, organic cocoa butter, organic vanilla), organic white chocolate (organic evaporated cane juice, organic cocoa butter, organic rice powder, organic almonds, organic vanilla), organic peppermint candy (organic evaporated cane juice, organic brown rice syrup, peppermint oil, red beet color), organic peppermint oil. Misc. info: Rainforest Alliance Certified Chocolate. Gluten-free info: Package states "Gluten Free". Each package contains 10oz (284g) peppermint bark. This stuff is awesome, I am so addicted to it. I am so happy you made a soy free organic dark chocolate treat. I wont buy anything with soy, so this makes me so happy. I cant get enough of this, the peppermint flavor is awesome! Thank you for making such a scrumptious product. This is so good. I also got some for my parents around the holiday - they loved it so much, I ended up getting more for them. I like the peppermint tatse without an overpowering sweetness. Owner Response: Hi Robin, We apologize that you did not like the Peppermint Bark. We work with our suppliers frequently and can pass along this feedback to them for next year.